Do you want to introduce your child to the wild animals that inhabit different corners of the world? Or are you looking to undertake a virtual safari adventure with him? 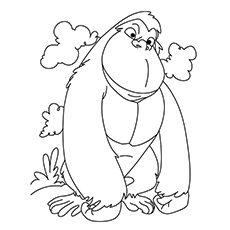 If you are nodding along, then you must introduce him to our gorilla coloring pages to print. Gorillas are the largest living primate in the world. They are close relatives of humans. Yes, we share up to 99% of the DNA with them! Gorillas live and travel together as a family, just like humans. But they are under constant threat from disease and hunting. 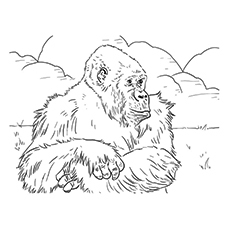 Here are ten coloring sheets that depict gorillas in their various moods. Your child is sure to love them. Here is a coloring image of the grumpy King Kong, the giant gorilla from the film of the same name. It is one of the most famous film icons of all times. 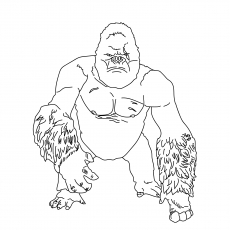 Ask your brave son to color this angry gorilla. Maybe it will cheer King Kong a bit. Do you want your child to learn the alphabets in a fun way? Then here is a perfect worksheet for him. 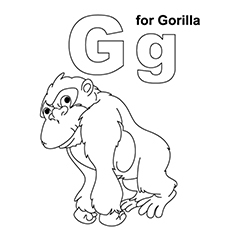 Your child can enjoy coloring a gorilla while he also learns the shape and sound of the letter G. The coloring sheet will also make a great addition to your child’s Alphabets coloring book. 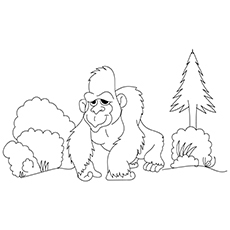 Here is a coloring sheet that shows a gorilla traveling through the forest. Gorillas walk on all fours as you can see in the image here. 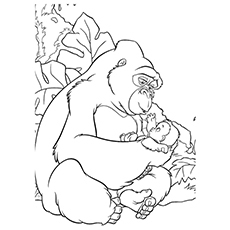 You and your little one can bring this majestic gorilla to life by painting it and its jungle home. 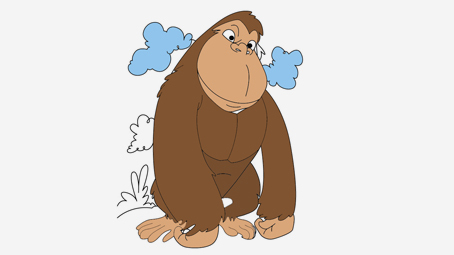 The animated gorilla you see here is Ajax from the Disney show ‘Donald Duck and the Gorilla’. In the cartoon series, it manages to escape from the zoo and reach the house of Donald Duck. It is an incredibly angry, brutal, and ferocious gorilla. 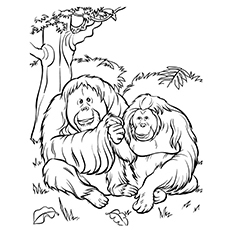 Here is an adorable image of Kala tending Tarzan. Kala adopted Tarzan as a son after rescuing him. Gorillas care a lot for their babies. They are affectionate, playful and patient with their young ones. 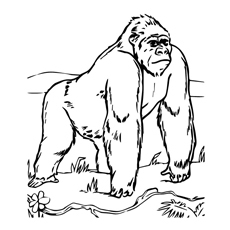 This is one of the best coloring pages of gorillas featuring a Mountain Gorilla. As the name suggests, Mountain Gorillas reside in mountainous forests. These gorillas have thicker and denser fur as compared to other apes. Their fur helps them survive in temperate regions. But as humans are moving more and more into the gorilla’s territory, the Mountain Gorillas are going further up into the mountains. The encroachment of their habitat is forcing them to endure dangerous and deadly conditions. The Eastern Lowland Gorillas are the largest gorillas in the world. They have a stocky body, a short muzzle, and large hands. They thrive on fruits, leaves, ants, etc. The Western Lowland gorillas are the smallest and most common of all the gorilla subspecies. You will find Western Lowland gorillas in Cameroon, Republic of the Congo, Equatorial Guinea, and Central African Republic. The Cross River gorillas are a subspecies of the Western Lowland gorillas. They differ from the Western Lowland gorillas in terms of the skull and tooth dimensions. The Cross River gorillas are wary of humans and inhabit the rugged terrains. The gorilla here looks furious. We think that it has spotted a predator. Whenever gorillas see a danger approaching, they thump their chest to make a loud noise and scare the enemy away. Otherwise, gorillas are very gentle and quiet animals. Tell your child to go ahead and add some vibrant hues to this page. 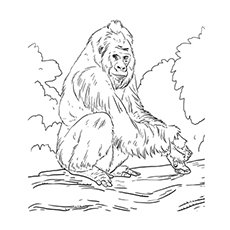 These cute free printable gorilla coloring pages online will be a hit with children of all ages. You can also plan a visit to the local zoo with your child to have a close look at the gorilla and other wild animals there. 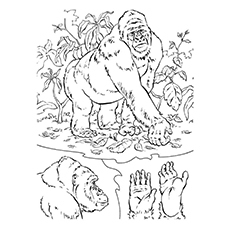 Did your child like our gorilla coloring sheets featuring the giant gorillas? Which page from this series is his favorite? Do tell us in the comments box below.